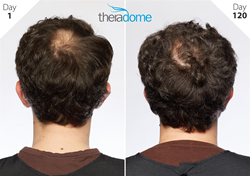 Theradome Inc., a Silicon Valley-based medical device company, shared positive results from a 120-day consumer study of male participants testing either the Theradome LH80 PRO or the Theragrow laser hair helmet. The study was set for 180 days but with positive results as early as day 120, Theradome was eager to share the outcomes. A group of 24 participants who were dealing with thinning hair used either one of the helmets for 120 days per the recommended use for each device. Photos were captured on day 1, day 60, and then again at day 120 to show improvement in hair growth and thickness. Positive improvements were captured every step of the way. None of the photos were edited or retouched in any way. In the United States, roughly 35 million men suffer from hair loss due to androgenic alopecia. By the age of 35, 2/3 of American men will experience some degree of appreciable hair loss, and by the age of 50, approximately 85% of men have significantly thinning hair. Both helmets invented by Theradome, harness the power of laser phototherapy to minimize hair loss and promote growth. Unlike other options on the market, Theradome’s laser helmets feature a proprietary laser technology developed to optimize light delivery and provide users with the ideal wavelength of light for hair restoration.